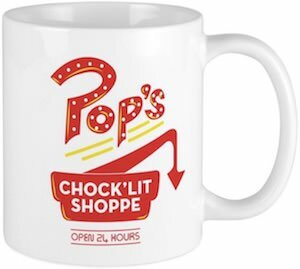 Riverdale fans can now drink their morning coffee from this Pop’s Chock’Lit Shoppe Mug. This ceramic Riverdale mug is available in different styles and sizes and on the mug, you can find the famous logo of Pop’s Chock’Lit Shoppe. A fun mug like this is just a great item a Riverdale would like and as it is microwave and dishwasher safe it can quickly become the everyday mug that you use at home or maybe even at the office. Having your favorite drink ready in this mug is a great way to start watching or rewatching Riverdale episodes.